A team at Qatar University has discovered a new species of crab during an exploration trip on the research vessel Janan. The trip aimed to investigate marine benthic biodiversity within the Qatar Marine Zone. A research team from the Marine Biology Cluster at Qatar University Environmental Science Center (QU-ESC) discovered a new species of crab during an exploration trip on the research vessel Janan. The trip aimed to investigate marine benthic biodiversity within the Qatar Marine Zone. Named "Coleusia janani", the new crab has never been collected or identified within Qatar's waters or elsewhere. It is a small crab of 13.6mm which inhabits a gravel/mud substrate associated with the oyster bed ecosystem. It has a bright orange and grey shell with two pairs of orange/red outlined circles on each side of the shell. Its legs and pinchers are white with orange bands. The investigation is a QU funded project. 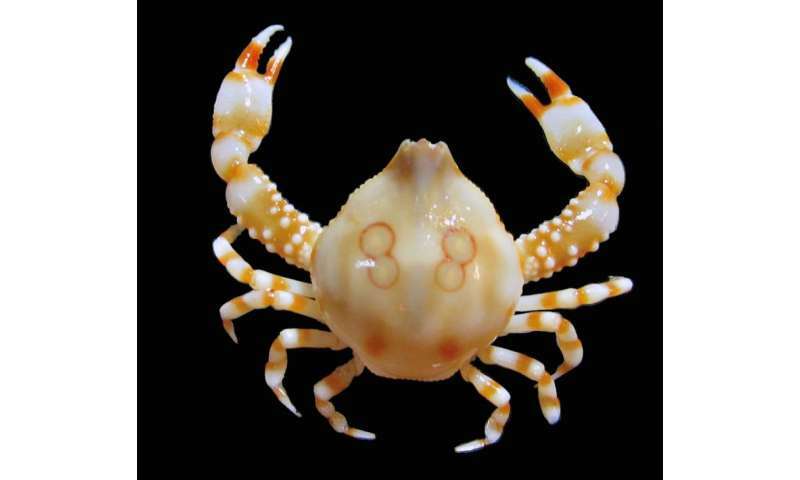 ESC Marine Operations and Logistics Manager Dr Ibrahim Abdullatif Al-Maslamani noted that the new discovery will definitely lead to new research as it highlights shortcomings in the current taxonomic descriptive identification keys and species lists of the Leucosiidae family of crabs in the Arabian Gulf. He said: "The discovery of Coleusia janani within the Arabian Gulf should trigger a revision of the Leucosiidae family of crabs in the region. This discovery underlines the gap in the taxonomic descriptions of the marine benthic environment and its associated species within the Qatar Marine Zone. It also represents a new species to science which is considerably exciting." He added: "This new discovery aligns with QU's commitment to study the marine environment and Qatar's territorial sea. The University has always taken the lead in efforts to meet the requirements for marine studies with the acquisition of the sophisticated research vessel, Janan and other powerful survey assets like speed boats, Remotely Operated Vehicles, and advanced analytical facilities. Additionally, QU's marine science program has produced many graduates whose contribution to Qatar's marine conservation efforts will be invaluable." ESC Director Dr Hamad Al-Kuwari said: "This new discovery adds value to the research achievements of QU researchers. We are delighted that this finding has been recorded by Janan, QU's state-of-the-art marine research vessel. Field trips on the Janan to various ESC marine project sites help our students to better understand the concepts of ocean science and biological and environmental science studies."